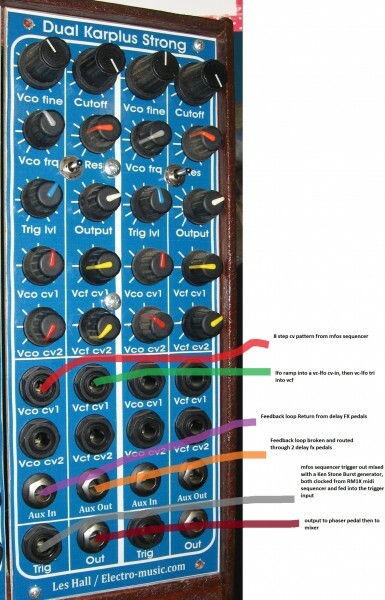 i decided to patch up the Les Hall / electro-music K S module and have a jam with some drums from the RM1X and a couple of mfos vco's into a ring mod. Setting up the K S i had a clock from the RM1X midi sequencer feeding the mfos sequencer & Ken Stone burst generator , both were triggering the K S , the cv from the mfos sequencer went into vco cv in & a couple of lfo's patched in series were controlling the vcf , the K S output went into a boost vca and into a phaser pedal & echo fx. There are two sockets called aux in / aux out these are normally closed with no jacks , it is the feedback loop of the KS circuit which can be re-routed through fx or another K S , i chose 2 delay pedals in series for unruly twangyness heheheh. Nearly 30 seconds of silence in the beginning made me think something was wrong with my headphones, lol! In any case, this track of sorts sounds pretty interesting, and it seems to be put together in decent sequence.